A weekend almost over, and (finally) a few updates to my London Underground in Films & TV webpage, with three appearances set in the 1960s, one contemporary, two retrospective. 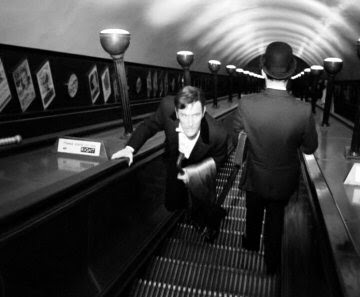 First, in the opening episode of Adam Adamant Lives!, the titular Edwardian adventurer is frozen by his fiendish nemesis in 1902, and is revived decades later to find himself in the Swinging London of 1966, specifically Leicester Square station. Groovy. 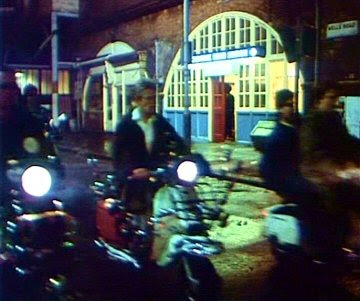 While the previous production showed part of the Underground system exactly as it was at the time depicted, by the time of the film of The Who's Quadrophenia, it was a case of 1979 pretending to look fifteen years previously. Most of the narrative is set in the Goldhawk Road area of West London, so the station itself is visible in a couple of scenes, with Hammersmith & City line trains passing on the viaduct in two more.